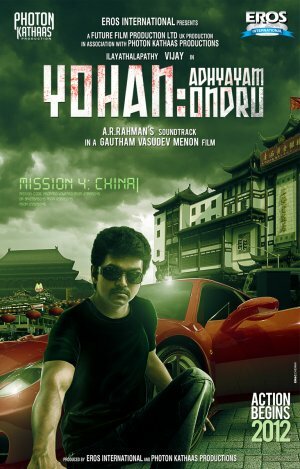 Mumbai, 12th December 2011: Eros International Media Ltd (EIML), a leading global company in the Indian film entertainment industry, has announced a co-production deal with Photon Kathaas Productions (“PKP”) for a Tamil film titled Yohan: Adhyayam Ondru (John: Chapter 1) starring Vijay. Produced in association with Future Film Production Ltd (UK Production), the film will be directed by Gautham Vasudev Menon with music by A R Rehman and is expected to commence production from Q2 2012. Mr. Gautham Vasudev Menon added, “I am really looking forward to filming an all-out action film after Vettaiyadu Villaiyadu. Also interesting because I will be working with Vijay for the first time. Yohan will be made like an international film while still retaining all the elements, especially music, that makes Indian cinema work. A.R. Rahman has already composed a theme song for the film which is simply outstanding. PKP (of which I am a part of) and I have found the ideal partners in Eros for a film on this scale, which needs to be produced and released on an international scale”. Mr. A.R. Rehman said of the association, “I am really excited working with Photon Kathaas and Eros on the movie Yohan. This is a completely new direction for both Gautham and me. We hope to come out with a product which is different yet rooted experience for the audiences"
"I am very excited about this project. Gautham and I have been talking about working together for a while and I'm glad that it’s finally materialized. Yohan is a totally new space for me and I'm sure my fans will love this action-thriller film. I am also excited about working with Photon Kathaas and Eros and am sure we will together create a landmark South Indian film", said actor Vijay.